Club Penguin Cheats by Mimo777 Club Penguin Cheats by Mimo777: Jet Pack Guy Apologizes! Jet Pack Guy has sent us a Club Penguin message to apologize! Oh great! Don't tempt the Bear again! Do you think Rookie will also try to take blame next? Hey Mimo You Stole My Idea Of Rookie Asking Next. lol xD. That's Okay. But Really I Think He Will Say It's His Fault. Yes, maybe rookie is the one who can stop Herbert's plan! We all know that he is very silly but becaue of that he can do things that almost impossible to do! What do you think? Hey if you go to upstairs at the dance club then you will see that they added a new arcade machine. New game coming and I bet its one from the beta testing. 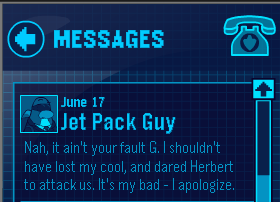 well it was nice of Jet-Pack Guy to apologise to G i guess. Mimo can you please leave a tracker? And, I think Herbert will attack soon, no ideas how though. If you have noticed there is a storm at the dojo courtyard. Well it was true the JPG DID dare Herb to the challenge so its good the JPG is apologized,I think. I think that Rookie will say something like this:Yes, you two are probably right, it was your fault. Yeah. I bet Rookie will take the blame next. maybe CP want's us to learn responsibility. That'd be great1 Club Penguin teaching life lesons with their games! Oh, yeah! I can imagine that! If u r reading this rookie, do not say a word. Or u dot. No, I don't think so. Rookie has taken so many blames already, we don't want another one added to his list. As you can see, there is no link. But I wanna tell you this. Visiting Rocketsnail's website, second page. somewhere along there you can see the history of CP and Penguin Chat 3 and stuff. Hey mimo with the new Music Jam Cap you can do a new dance with only it on!!! sensei has a new power card and he has one of those EPF costumes on and snow balls get thrown at you! You know, I think you might be right. That makes me think about how Rookie is stil an EPF agent EVEN though he messes up alot. That makes me think that Club Penguin is going to do something about him that is good.